This entry was posted on December 11, 2013 by Theresa Frassrand. • The Joyful Mysteries: Mary’s fiat and the early life of Jesus. • The Sorrowful Mysteries: The sufferings of Jesus, including His death. • The Luminous Mysteries: The ministry of Jesus. • The Glorious Mysteries: Jesus’ defeat over death and the divine events that followed. The events are called decades because of the number of prayers, specifically Hail Marys, said for each. Each decade consists of one Our Father, ten Hail Marys and one Glory Be. In order to keep track of the prayers said, Catholics use beads to count. The set of beads designed for these prayers is called a rosary (lower case “r”), and often has a crucifix attached along with an additional five beads for introductory prayers. This rosary is considered a sacramental because it is a physical reminder of our relationship with God; just as having a picture of a loved ones would be a reminder of them. The Rosary is meant to be prayed daily. While many pray all four mysteries at once, some are able to only pray one mystery a day. Each mystery has a day of the week assigned. These combinations are recognized by the Church and allow for unity throughout the world. Even when praying alone, one can be comforted in knowing that all over the world fellow believers are meditating on the same mystery. 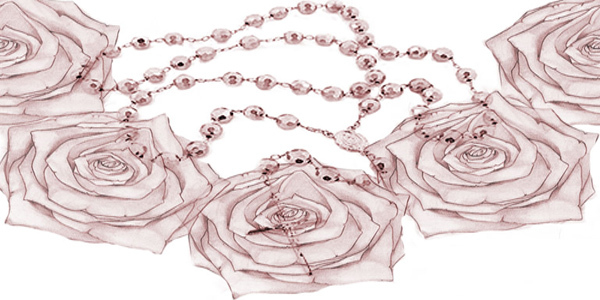 Click here for a STEP BY STEP GUIDE to praying the Rosary.